Roxhill Park and Bog as they exist today. 3D rendering from iMaps and satellite images. This is a dedicated page that WWRHAH will maintain for the course of the work of the Roxhill Bog Committee as a clearing house of information and documents related to their work. The long term goal we are pursuing is to help protect the headwaters of Longfellow Creek in West Seattle and to safely repair the Roxhill Bog to it’s original wetland state, without harm to the park’s neighbors. The research of our Bog Committee has turned up evidence that this may be possible, as we learned in our March 6th, 2014 WWRHAH Community Council meeting (our meeting’s [full notes here]; the Bog details are toward the end). If you have or know of any information related to this work in progress, please e-mail any details you know to info@roxhillpark.org. Why is Roxhill Bog so important? What’s wrong with the bog today? What is WWRHAH doing to fix this? The history of Roxhill Park’s Bog. Historical documents related to Roxhill Bog. Letter from WWRHAH to the City of Seattle and King County. Contact us if you know more. As the drainage basin for sixty surrounding acres, Roxhill Bog collects sediments and pollutants from rain and storm water run off. Plants absorb some pollutants while the spongy peat soil helps filter sediments. At the headwaters of Longfellow Creek, this wetland acts as an essential water filter for a 3.5-mile long waterway that’s home to coho salmon, ensatina salamanders, and red foxes feeding downstream. The creek drains a 2000-acre watershed and is one of the few year round free-flowing creeks in Seattle. The bog’s water levels are too low. The bog’s water levels fluctuate too much. The reduced water levels could eventually cause the destruction of the natural peat base, which may be irreversible. There are several possible contributing factors to the low water levels, including possible flow thru the storm water drainage system and evapotranspiration from the trees, shrubs and forbs planted around the bog. We can’t know the exact cause without a study. SPU is currently helping with a preliminary study of the storm drainage system and our committee is looking at the evapotranspiration issue. In addition we need to examine the inflow of water to the bog and look for possible sources of additional water to support rehydration. 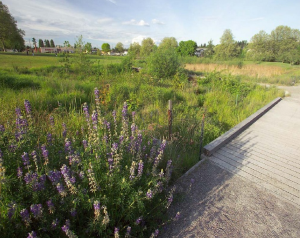 The current condition of the bog and park may be contributing to periodic flooding north along the Delridge corridor, all the way to the North Delridge neighborhood. Bog trail, from Starflower 2007 report. 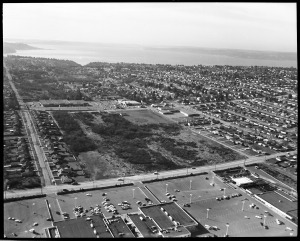 We’re currently researching this issue with Seattle City Parks, and are digging into records and the history of the project with them, Seattle Public Utilities, and King County. Develop a new park hydrology model. Design hardware and/or vegetation changes and possible additional water collection systems. The building and installation of it all Follow up study to make sure it’s working. It will need to go through Seattle City Parks, Seattle Public Utilities, the King County Department of Natural Resources, and their Waste Water group. Westwood and Roxhill, 1953. 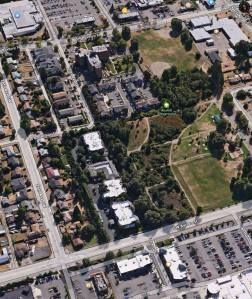 The park, Westwood Village, and the school areas are all farms and wetlands, still. For an idea of how old Roxhill Bog is, this Wikipedia article details the state of the world at it’s inception. W. Roxbury Paving. Peat Bog. 26th Ave. SW. and Barton. Mar 31, 1961. Aerial of Roxhill Park, 1969. A system map of Roxhill Park’s bog cells, numbered 1-4. The cells are the roughly rectangular areas surrounded by trails on this map, toward the right hand side. The top of the map is north at SW Barton Street. Just off of the top of this map would be the Westwood Village Shopping Center. Just off of the bottom of this map is SW Roxbury Street. The area where it says “Abandonded Laterals” is cell #1, with cell #2 below that, then cell #3, then cell #4, which is largest, and turns toward the left side of the map. A system map of all the nearby storm and waste water drainage systems near Roxhill Park. A study of the peatland hydrology done by King County Department of Natural Resources. Recommends further study of hydrology, development of water flow model and design of facility to control water. The report’s date is March 2000. Starflower Foundation survey and report on the results of the 2000-2007 restoration efforts. Contains background history, description of restoration efforts, and species survey. Prepared by David Perasso of our WWRHAH Bog Committee, with our then preliminary findings. An older version of this document from February 2014 is available here. Here is the letter that was sent on Friday, March 14th, 2014 to Seattle Mayor Ed Murray, King County Executive Dow Constantine; Seattle Councilmembers Jean Godden, and Sally Bagshaw, who chair the city council committees that oversee Parks and SPU; and King County Councilmembers Dave Upthegrove and Rod Dembowski, who chair their county committee counterparts; and it was also CC’d to City Councilmember Tom Rasmussen, who is our de facto District 1 representative at the moment, and County Councilmember Joe McDermott, our County District 8 representative. 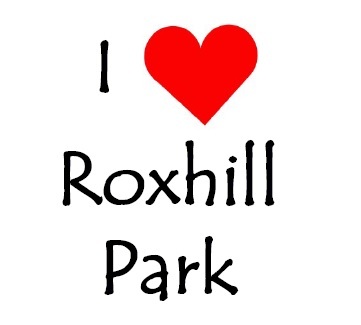 We have been, over the past year, pursuing and investigating various issues surrounding Roxhill Park (http://www.seattle.gov/parks/park_detail.asp?ID=464) in West Seattle, ranging from it having a new King County Metro Transit Hub put next to it, to it’s crime rates, to a host of other problems. In the process of researching all of this, we gradually began to get more and more people attending our meetings with backgrounds and careers in ecology, forestry, and other environmental sciences, due to the unique character of this park and their happening to live in our WWRHAH area. The most likely cause: a storm water drainage system which may be acting as a French drain surrounding the park is draining the bog. We can’t be positive without a full hydrological study, but it’s highly likely that this is the cause. We’re mailing today to inform you of this and to ask for your support in the investigation of this with the very skilled members of our “Bog Committee”. 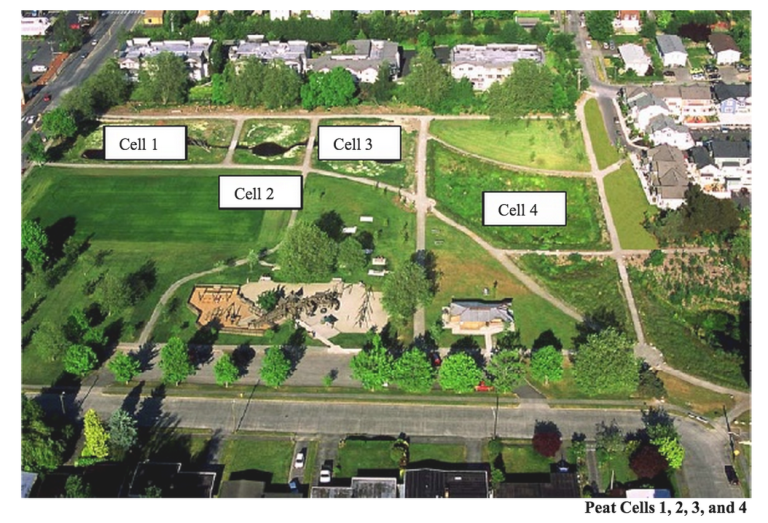 We initially believed this would be a matter to be pursued through a grant of some sort through the City’s Department of Neighborhoods, but the more our people dug into this, it began to appear to be a general SPU and/or Parks issue. It may be a necessity to address this, versus a “nice to have” scenario better suited for the city’s competitive neighborhood grant process. If our team’s early assessment is correct, a coffee dam (sort of a water retaining system) would be required to be placed inside of the perimeter of the existing “French drain” system. This would allow rain water, standing water, and natural storm water run off to be retained more appropriately in the bog year round, while still allowing the existing drainage to continue outside of that, protecting the recreational park areas we have put a lot of restoration and project money into over the years, and protecting the urban neighbors of the Roxhill Bog: Daystar Retirement Village, Westwood Village Shopping Area, Roxhill Elementary School, a SHAG retirement building, a complex of low-income housing, and various single family homes. Please let us know if you have more information about this.